Russian Attack Slots is 3 reel, 3 line video game designed by Top Game. This game has very unusual theme – Soviet Union. So, this game gives you chance to peep over the iron curtain in order to win real Soviet jackpot – 6,000 coins or $30,000. This game is available in no download version, so you can play it instantly in the browser. Russian Attack Slots has following symbols: Triple Bar, Double Bar, Single Bar, Bellows and Balalaika. Special game symbol is Hammer and Sickle. Moreover, the reels will be spinning to the accompaniment of Russian traditional Kalinka Malinka that is really funny. Before to be attacked by unexpected wins, choose one of the coins denominations: $0.01, $0.05, $0.10, $0.20, $0.25, $0.50, $1.00, $3.00, $5.00. The minimum bet is $0.03, the maximum one is $15.00. 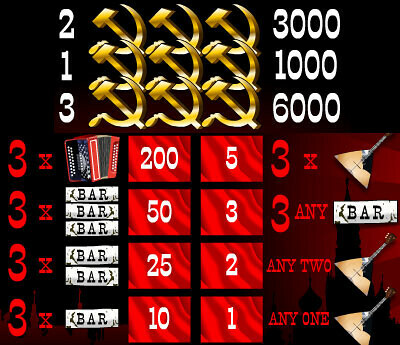 The highest Russian jackpot is 6,000 coins or $30,000 for 3 Hammer and Sickle symbols on the third line. The second Russian jackpot is 3,000 coins or $15,000 for 3 Hammer and Sickle symbols on the second line. The third Russian jackpot is 1,000 coins or $5,000 for 3 Hammer and Sickle symbols on the first line. The wild symbol in this game is Hammer and Sickle. This is the special symbol because it can substitute for other game symbols to make the winning combination complete. 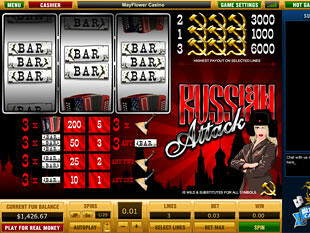 Russian Attack slot machine is one of the best classic games designed by Top Game. This game promises you a lot of positive emotions as well as a lot of great awards.